From ONLY $3,475 per week! 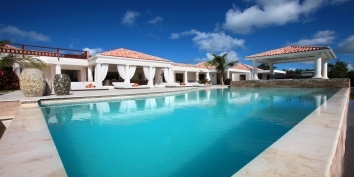 Find out more about Villa Positano, Sapodilla Bay Beach, Providenciales (Provo), Turks and Caicos Islands. Last Minute Winter Specials ONLY $5,200 per week! Find out more about Sea Edge Villa, Grace Bay Beach, Providenciales (Provo), Turks and Caicos Islands. From ONLY $2,970 per week! Miami Vice One is the perfect choice for a couple who appreciate contemporary luxury and personal space. 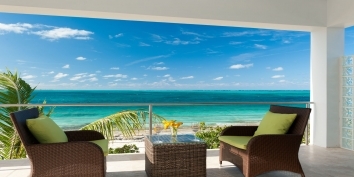 With breathtaking views of Sapodilla Bay, Providenciales (Provo), Turks and Caicos Islands, this one bedroom, duplex, oceanfront villa was only completed in December 2014. Miami Vice One also has an extra large, diminishing edge swimming pool and private oceanfront access to the crystal clear sea. Find out more about Miami Vice One, near Sapodilla Bay Beach, Providenciales (Provo), Turks and Caicos Islands. Last Minute Winter Special ONLY $5,200 per week! Find out more about Water Edge Villa, Grace Bay Beach, Providenciales (Provo), Turks and Caicos Islands. Last Minute Winter & Spring Specials from ONLY $4,700 per week! Find out more about Ocean Edge Villa, Grace Bay Beach, Providenciales (Provo), Turks and Caicos Islands. Last Minute Winter Special ONLY $4,900 per week! Find out more about Ballyhoo Cottage, Grace Bay Beach, Providenciales (Provo), Turks and Caicos Islands. Last Minute Winter & Spring Specials ONLY $3,900 per week! Find out more about Nutmeg Cottage, Grace Bay Beach, Providenciales (Provo), Turks and Caicos Islands. Last Minute Winter Special ONLY $3,700 per week! Find out more about Coriander Cottage, Grace Bay Beach, Providenciales (Provo), Turks and Caicos Islands. Last Minute Winter Special ONLY $3,900 per week! Callaloo Cottage, Providenciales (Provo), Turks and Caicos Islands. A charming, intimate, beachfront, vacation cottage with private swimming pool, gazebo, and fantastic views. This Caribbean rental cottage has one bedroom, one bathroom, open plan living room and kitchen, and even a hammock hut on beautiful Grace Bay Beach! Find out more about Callaloo Cottage, Grace Bay Beach, Providenciales (Provo), Turks and Caicos Islands. From ONLY $3,600 per week! Exquisitely designed and furnished, Sugar Kube is your tranquil new three-level, one bedroom, beach villa just footsteps to spectacular Grace Bay Beach and Smith’s Reef – a snorkelers paradise. Find out more about Sugar Kube, Grace Bay Beach, Providenciales (Provo), Turks and Caicos Islands. If you would prefer to spend some quality, shared time with the whole family, we have more than 70 larger Turks and Caicos villa rentals and more than 200 larger Caribbean villa rentals waiting for you and your whole family.